Belsebuub’s Searching Within course provided a foundation in the key principles and practices of self-knowledge, giving participants the tools needed to increase self-awareness and to explore their own psychology. It was first published in 2001 as an online free course, as part of a pioneering series of online courses released on the website Mysticweb, and was also given in person at study centers of The Gnostic Movement, a spiritual organization that Belsebuub founded. Over a ten year period, Searching Within reached tens of thousands of people who registered for it online, attended one of the face-to-face sessions held in cities around the world, or purchased the course in book form. The course offered a practical framework for inner change that people could apply in their own daily lives. Over the course of nine weeks, participants learned about the different components of the psyche, how to observe and study oneself, and how to begin a journey of lasting inner change. Many people who took the course cited the transformational impact it had on their lives and the enduring benefit they received from applying its techniques. 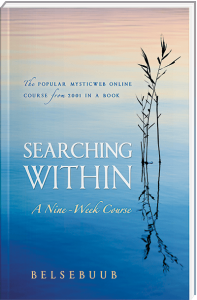 The Searching Within course was originally published online and divided into eight weeks (this was later expanded to nine weeks). Each week would have a topic and an exercise. The topic would include a discussion about a particular area of self-knowledge to provide a conceptual foundation, and then the exercise would provide a technique to allow course participants to explore the topic in their lives. In the early iterations of the course, both the topic and exercise were PDF documents. Every week an email would notify course registrants that the new weekly material was available, and people would log in to an online course system to download the PDFs. A private course forum was a key part of the learning experience, as this provided a place where people could ask questions and receive additional clarifications and guidance on how to approach the practices. Initially Belsebuub answered all these questions himself, with some of the original questions and answers being included along with the weekly topics in later iterations of the course material. The course forums also introduced a feeling of community among the participants, who despite coming from many different countries, backgrounds and walks of life, could find common ground in their efforts to learn about themselves and through the forums could provide each other with support and inspiration. There was additionally a public chat room on Mysticweb, which allowed people to communicate in real time. Later iterations of the online course became more technically sophisticated, with videos replacing the PDFs and richer interactive features being added to the course system, such as the ability to track personal goals and to keep a personal journal of progress through the course. The online course also included live interactive sessions using both audio and video conferencing systems, where course participants could interact in real time with qualified teachers and each other, no matter where in the world they were located. The course was also delivered in-person in 18 cities across North America, Europe, Australia, and Asia. For these in-person sessions, a qualified teacher would explain the topics and guide practices based on Belsebuub’s course material. For some of the time that the Searching Within course was running, participants in a live course could also access the online course materials as well. Eventually the course material written by Belsebuub was published as The Peace of the Spirit Within in 2006, and this book became a supplement to both the online and in-person versions of the course. The name of the course also evolved over time. Initially it was called A Course in Self-Knowledge but in 2003 was renamed Searching Within. In 2006 the name changed again to A Course in Self-Discovery, and then in 2010 was renamed to Self-Knowledge again. However, regardless of the name, and although Belsebuub continually updated and improved the material over time, the core topics and framework of the curriculum remained consistent over the course of a decade. The course material came from Belsebuub’s personal experience of going through a process of spiritual transformation – which he began in 1990 – and from his experience teaching in person in cities across the UK and Australia for over a decade. Belsebuub was also the personal student of Samael Aun Weor’s disciple Rabolu. Samael Aun Weor was a South American author who published extensively on spirituality and esoteric psychology. The foundation of the course was built on an understanding that there are different parts of a person’s psychology, which influence our lives in very different ways . Belsebuub states that the subconsciousness is typically the most prominent part of a person’s psyche and that it is made up of many different inner states such as anger, negativity, fear, pride, greed, which Belsebuub refers to as the egos. These various ego states are essentially animalistic, creating impulses to search after pleasure and avoid pain. However, Belsebuub explains that all these subconscious states ultimately lead to great suffering in life, as they leave us bound by desires and cravings, lacking true peace and living a life psychologically asleep. The most common states felt by most people are low ones. Because they are so much a part of the psyche, people have them and don’t even realise it. There is a continual search for pleasure, for entertainment, which is an escape from internal misery, a simple moving away from pain and towards pleasure response. As a person moves away from pain and into pleasure, the mechanism continues and pain reasserts itself. In contrast however, Belsebuub states that people also possess consciousness, which he describes as the spiritual essence of a person, the part of us that gives rise to self-awareness, intelligence, and spiritual states such as peace, happiness, and love. The part that is aware is consciousness; it is the spiritual part, the immortal essence of a person. All spiritual growth, true wisdom, intelligence, love, peace, and mystical experiences take place within the consciousness. The primary goal of the Searching Within course was learning how to gain self-knowledge, which Belsebuub states is the foundation of inner change. He explains that the egos influence much of our day-to-day behavior and decision-making, causing most of daily life to be lived without true consciousness. However, he states that by studying and learning about the subconscious, we then create the possibility of freeing ourselves from it and changing our way of being. Belsebuub explains that this learning process begins by waking up and developing consciousness, which allows us to increase self-awareness and gain knowledge about ego states and how they work. In this way we can gradually change our way of being from one controlled by the lower, unpleasant and self-centered states of the egos to one that is more conscious and spiritual. When we change inside and develop consciousness, our whole way of being, of acting changes for the better. The life of each person is controlled by what is within; actions occur because of what is within. If what is within is a confusion, a bundle of inner states that appear of out nowhere, a mix-up of pleasure, pain, compulsive desires, negativity, etc., then the actions will be the result of all that. Just because this is the normal way of being for almost all people doesn’t mean that it has to be that way. Belsebuub described how this change could have a dramatic impact on our lives, from how we experience events to the quality of our relationships. He also explained how this type of self-knowledge could be the starting point to a much more profound spiritual journey, stating that the consciousness can grow, be transformed, and ultimately reunite with its divine source. The key tools for gaining self-knowledge in the Searching Within course were techniques that Belsebuub referred to as “awareness” and “self-observation.” He wrote that they are both part of consciousness perceiving, with awareness being a perception of the external world of the senses and self-observation being a perception of the internal world of thoughts, emotions, the various motivations for our actions, and so on. These key practices were given early in the course and provided a foundation for other take-home exercises and self-knowledge explorations in subsequent weeks. The course topics and exercises over the nine weeks are listed below. Click on the buttons to read a summary of the material for that week, or read the full ebook here. Belsebuub has had a lifelong interest in spirituality, starting when he had many paranormal and mystical experiences as a small child. As a young adult he felt driven to search for spirituality, exploring various teachers, spiritual texts, and groups, visiting different sacred sites, and spending time in nature. I felt the need to change and searched very hard to find out how I could do it. The search, the reasons for the search I could never quite put into words—I wanted peace, a spiritual peace, and wanted to experience mystical states and to be free from all the different and miserable states that I normally felt. Belsebuub states that in 1990 he discovered a modern day esoteric school that taught the techniques needed for spiritual transformation. As he describes, “when I came across something that actually worked, I applied myself to it wholeheartedly, was as as though something very valuable had been given to me, which it had been.” 5 During this time he states that he began a gradual process of enlightenment, a process he continues to this day. Belsebuub began teaching and gave classes for ten years in cities across England, Scotland, Wales, and Australia. He taught thousands of people the fundamentals of self-knowledge, consciousness, awareness, and self-observation. He also learned a great deal about how to best communicate information on self-knowledge, the common questions and challenges that arose for people first starting to explore the subject, and methods to help people quickly gain their own experience of consciousness. In 1999, Belsebuub helped found a new spiritual organization in Australia and was elected to lead it by its members. Looking for a way to reach a global audience as quickly as possible, he turned to the internet (still in its infancy) and created a plan for publishing a series of online courses. Online learning was also a relatively new concept in those days, and online courses about spirituality were rare or non-existent. In 2001, Belsebuub began publishing these new online courses, starting first with a course on astral travel and dreams, followed weeks after the end of the astral travel and dreams course by the Searching Within course. Interest in the course developed quickly. People from around the world began connecting online through a common spiritual interest to explore something new, which generated a high level of excitement and engagement from those who signed up. Belsebuub wrote the course material a week at a time, often publishing it immediately once finished. He then went back and continued to revise and correct the PDFs and incorporate new material, such as questions he had answered. All the courses Belsebuub published were free, as he works according to the principle that spirituality is a gift from the universe and should be passed on in the same way. For this reason he has never charged for teaching or received any royalties for his books. The Searching Within course offered a unique opportunity for people around the world to explore self-knowledge in their own lives and to share their insights with each other. Many participants described the enormous impact the course had on them, helping them cultivate a source of peace and happiness within, overcome negative inner states, and discover a spiritual purpose to life. You can read articles from people who have taken the course and shared their experiences by clicking the button below. Pritchard, Mark. “Week 1: An Introduction to the Course.” Searching Within: A 9 Week Course. 2001. An online course published on the website www.mysticweb.org. Pritchard, Mark. “Week 2: The Components of the Psyche.” Searching Within: A 9 Week Course. Op cit. Pritchard, Mark. “Week 1: An Introduction to the Course.” Searching Within: A 9 Week Course. Op cit.